The house will smell so good when you get home if this is in the slow cooker. optional: cook rice noodles and serve soup on top. if adding curry paste to individual bowls, add the curry and a little broth first, then the noodles, then the rest of the soup, coconut milk, lime and garnishes. *ideally: cook the chicken first overnight in the slow cooker or for a couple hour in the morning to make a broth. You can pull the chicken out and skim it. Then add the rest of the ingredients and reduce cooking time to 4-6 hours. ***kid-friendly - if only some people in your family like spicy food, omit the curry paste and instead put 1 t curry + 1 T hot broth into each bowl, stir to combine, then add the rest of the soup. You can do the same with the coconut milk if you want, adding a little into each bowl and giving a stir. 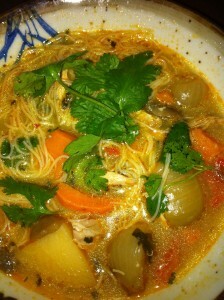 This entry was posted in Main courses, Recipes and tagged Asian, kid-friendly, Slow Cooker, soup. Bookmark the permalink. Both comments and trackbacks are currently closed.